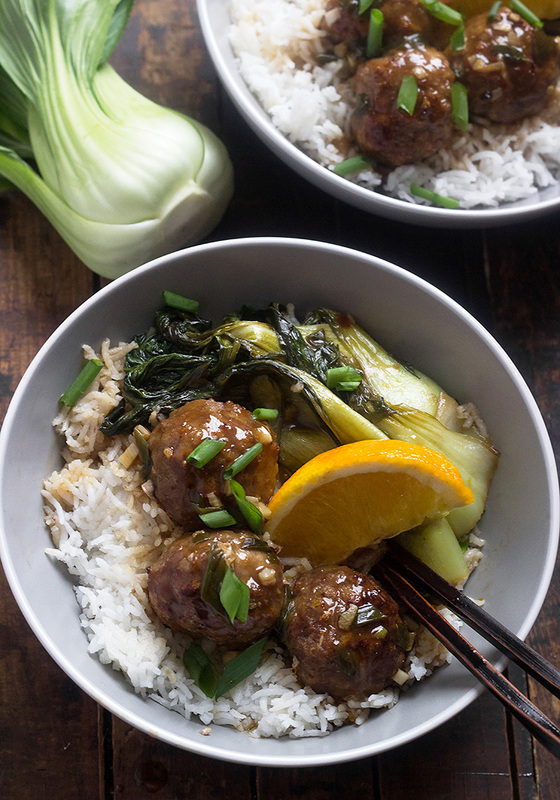 Fast, easy and delicious, this Hoisin Orange Chicken Meatball Bowl is perfect for a busy weeknight meal. 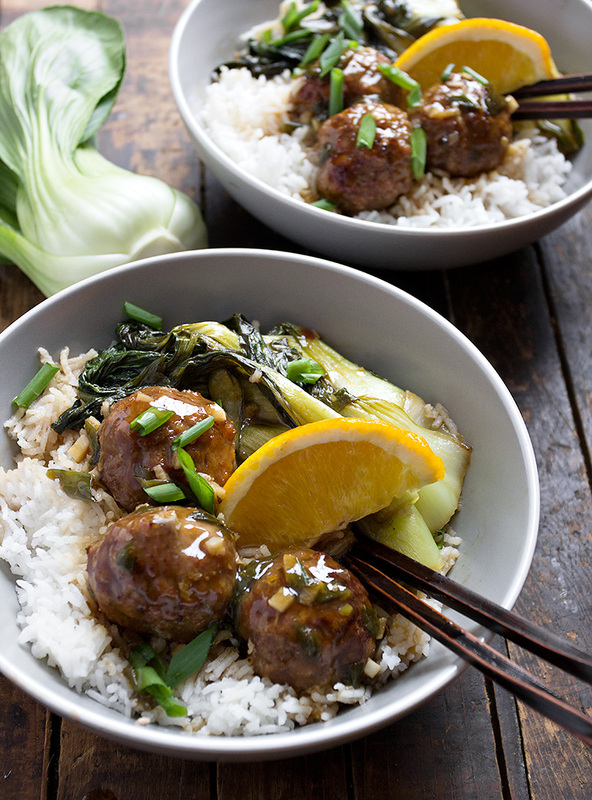 Using lower-fat ground chicken and stir fried bok choy, this is also a lighter meal option! I love baking with citrus, but I didn’t want to ignore the fact that citrus is also fabulous in cooking, as well! 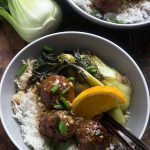 This Hoisin Orange Chicken Meatball Bowl is a great example of how you can use some of the Winter’s best citrus in your weeknight dinners. For these meatballs, I used ground chicken. I have to say, I’ve not always been a big fan of ground chicken, but when it’s flavoured well, it’s a great lean choice. These meatballs are baked quickly in a hot oven. While the meatballs are baking, simply put on some rice or grains and prepare your veg and sauce. It all comes together quickly in a wok or hot frying pan right at the end. I used basmati rice in my bowls (because we all know I’m a shameless carb-o-holic ;), but brown rice, quinoa or other grains would also be a great choice. You can easily substitute ground turkey, pork or beef for the ground chicken here. The time in the oven should be the same, but I would always encourage you to check with a thermometer, just to be sure they are cooked thoroughly. When I cooked this up, I quickly stir fried the greens first, then added the sauce, which works fine, but makes the greens quite well cooked. If you prefer your greens just wilted (I think I do, actually), remove the greens before adding the sauce. 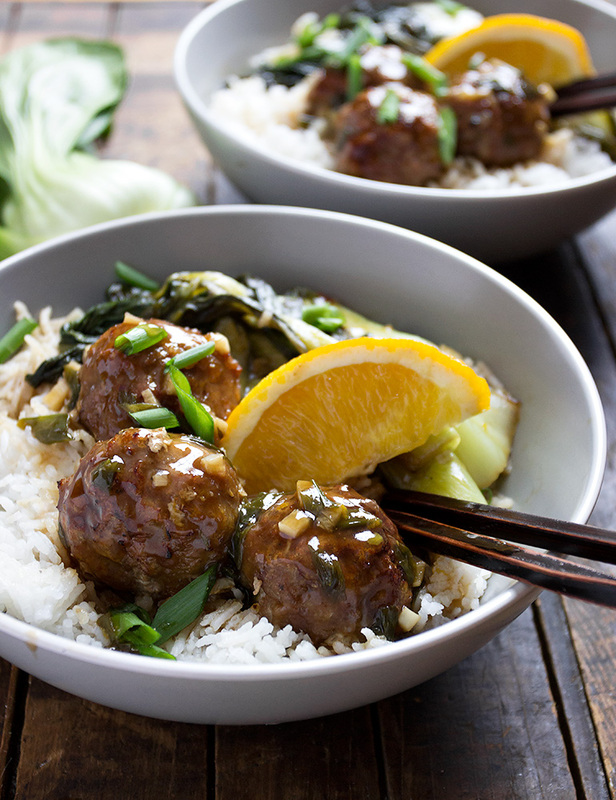 Lean oven-baked chicken meatballs, topped with a hoisin orange sauce and served with quick sauteed greens on top of rice. Preheat oven to 460 F. Line a baking sheet with aluminum foil (for easy clean-up) and set aside. If making rice or grains, start that cooking first. In a medium bowl, combine the ground chicken with the flour, soy sauce, hoisin sauce, ginger, garlic, red pepper flakes, orange zest and salt and pepper. Form mixture in to walnut-sized meatballs and place on prepared baking sheet. (I got 15 meatballs out of 550g of ground chicken). Bake meatballs in preheated oven for 10-15 minutes, or until lightly browned and cooked through. Meanwhile, prepare sauce by combining all the sauce ingredients in a small bowl. Prepare greens by roughly chopping and removing stems, if necessary. Heat oil in a wok or skillet over medium-high heat. Add greens and cook, stirring constantly, until just wilted. Add garlic and ginger and cook, stirring, for another 30 seconds. (If you'd like your greens to stay just wilted, remove to a plate before adding sauce, otherwise, just leave them in). Add sauce and cook, stirring, a minute or so until sauce is hot and thickened. Remove from heat. To serve: Spoon rice in to serving bowls. Top with greens and meatballs. Spoon sauce overtop. Garnish with chopped green onion and an orange wedge, for drizzling. I know fresh ginger is best but can you use ginger powder instead? Hi Janice and yes, you can. You’ll use a lot less. The ratio is roughly 1/8 tsp powdered ginger for 3 tsp fresh. (Btw, have you ever tried the ginger in the tube that is available in the produce section? I love that stuff. A little milder than freshly grated fresh ginger, but still with the fresh flavour. And it keeps forever in the fridge, so I’m never out). Finally made this for dinner tonight. Really liked the flavours. And made the meatballs small so I have extras to put in the freezer for another meal. ? Glad you enjoyed this one, Sandra and great idea making extra meatballs for another meal! You and I like a lot of the same things, Jennifer. I don’t often cook with ground chicken either but I have been spicing it up and it makes such a huge difference. LOVE my citrus – especially this time of year. And I’m all about slightly wilted greens – anything more just doesn’t do it for me. So that said, this is my idea of a perfect meal especially because meatballs cancel out everything else, lol. There is nothing better – period! Thanks Jennifer. This was delicious and got rave reviews! Love your recipes and your blog. You explain everything so well and make your recipes so easy to follow. I appreciate all you do! If I use beef, do I have to change anything? Do you think it will be ok? It would be all good Dena. Shouldn’t have to change anything. I do like using ground chicken in some of my dishes and this recipe is going to be another one. The combination of the citrus and ginger is right up my alley. As always, your pictures are wonderful, you’re making me hungry and I just ate….LOL! Thanks Dalila :) You will love this dish, for sure then! Yummy! My kind of dinner, for sure. 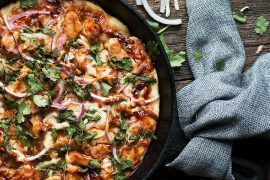 I’m with you – ground chicken is not always my first choice but in something like this, so full of flavor, it’s wonderful! Thanks Chris and I have to say, I rather enjoyed the chicken meatballs. The texture is obviously more dense than beef or pork, but they had lots of flavour and were nice and hearty! 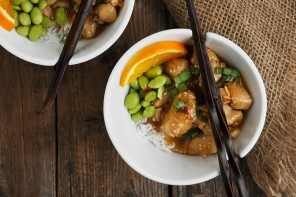 Ginger and garlic and orange – what a terrific, flavorful combination! Your creativity cannot be beat Jennifer and the photos are absolutely gorgeous. Baby Bok Choy is one of my favorites too – I love everything about this dish but especially how easy it is to put together. Amazing! Thanks Tricia :) These are my favourite meals – full of flavour, easy and a little leaner! Citrus season is the best, right?! 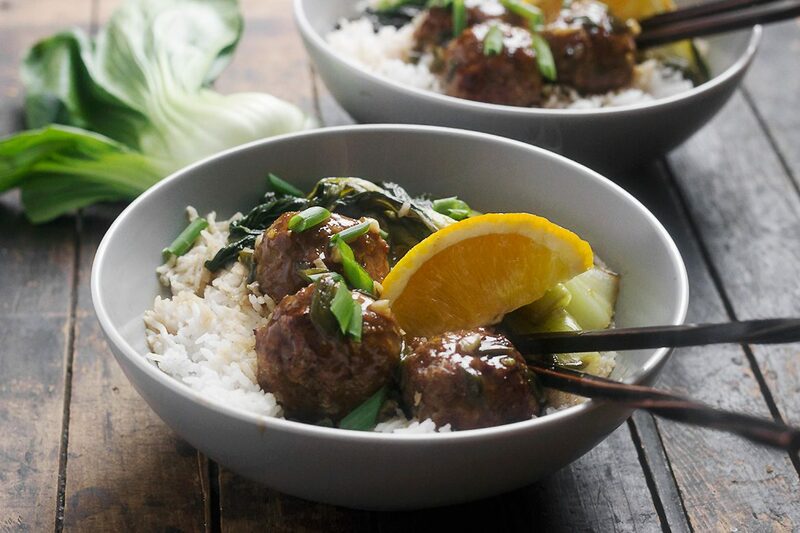 While I love baking with citrus, I’m more of a savory girl, so these meatball bowls are right up my alley! I love the hoisin and orange pairing here! AND the bok choy – it’s so underrated! 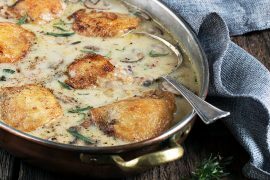 I am totally making these for dinner sometime soon! Cheers, girlfriend! Thanks Cheyanne :) There is nothing like a little citrus to brighten up a dish, especially this time of year! I love baking and cooking with orange too Jennifer. I’ll definitely need to try these meatballs. The sauce sounds so flavorful. I also love that you served it with bok choy. Can’t wait to try.